With this Bind-O-Rama we celebrate the 20th anniversary of this list (we went online June 23rd 1994) and thank everyone for being a part of the Book_Arts-L community, whether active poster or lurker. Never thought it would go on this long (the crazy part). What started as an antidote to my professional isolation in the wilderness that was Central New York quickly grew into the most active book arts community, a placed where seasoned professionals, students, and anyone in-between talked shop and shared generously via their questions and answers. Back in 1998 I was invited to speak about the growth of the "Internet" as a tool for book artists at the 25th anniversary of the Silver Buckle Press in Madison, Wisconsin by Tracy Honn... That was 4 years into this adventure, and the talk is online at . While the growth in numbers of those online has exploded, much else remains the same. Some of my "fondest" memories include teaching folks how to use email... Looking at the list interface (subscription, posting, ...) it seems very dated, Web 0.5ish... Still, it works and is as active as ever, with many who joined in the first days and weeks still active today. The works shown below were submitted by subscribers and represent their best effort from the past 3 or so years. Given the demographics of the list I expected more artist's books than traditional bindings, but a very nice range of work non-the-less. The books are beautiful and varied and each one has the following information: Binding Description, The design /concept for the book is, and Binder's Bio. See them at Bind-O-Rama 2014. 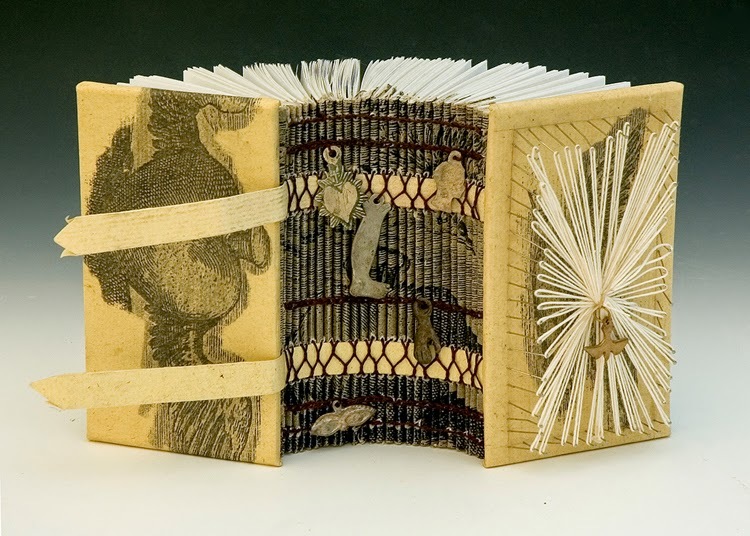 And if you are not a subscriber to the Book Arts List, I suggest you join. You can also search the extensive archives. Everyone freely shares their knowledge and thoughts. Book above is by Douglas Baulos, Birmingham, AL, USA.